Gawai Dayak is a harvest festival that celebrates the indigenous peoples of Sarawak. The term Gawai Dayak which translates as ‘Dayak Day’ not only honors the region’s native Dayak people but it also celebrates several other indigenous tribes of Sarawak, like the Iban, Kayan, Kenyah, Kelabit and Murut peoples. These proud tribesmen of Sarawak were once infamous for their headhunting activities though they have since abandoned such gruesome practices for more ordinary pursuits. The celebrations of Gawai Dayak are not merely held for tourist consumption, but feature the whole-hearted participation of the entire community. Moreover, the festival date of 1st June each year is also considered to be an ideal time for hosting weddings and other festivities that involve all the family. 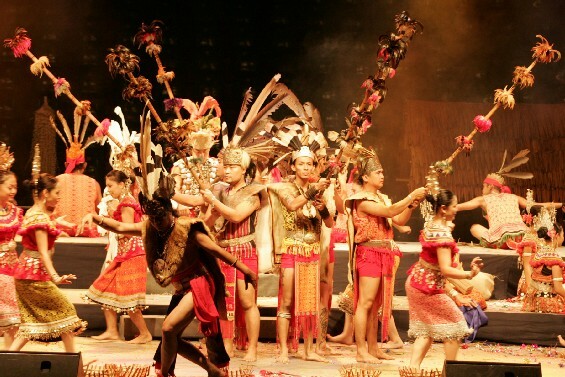 Gawai Dayak celebrations have long been associated with the Dayak people. The festival however, was designated an official event on the Sarawak event calender only as late as 1965, after the state got its independence in 1963. For until then, the colonial government refused to grant the event official status, as it was wary of getting similar requests from other indigenous peoples. The government though went on to declare the date of June 1st as ‘Sarawak Day’. This commemorative celebration was rechristened as Gawai Dayak after Sarawak achieved independence from the British. The revelries associated with the festival usually get underway on the 31st of May; however these traditional celebrations, which feature much indigenous music and the conduct of a ritual called Muai Antu Rua to prevent greed, are closed off to tourists. The conduct of the Muai Antu Rua ritual is carried out by two men who usually drag a basket through the corridors of a longhouse. Each resident family of the longhouse then throws unwanted clothes and household items into the basket as it passes their residence. The basket is later dumped so as to avert any intrusion from evil spirits. After this at the sunset hour, the festival chief sacrifices a chicken in honor of the gods, to thank them for good rice harvest and ask for a similar result the following year. This sacrifice is usually followed by a celebratory dinner, which features delicacies like bamboo steamed rice and sweet cakes crafted from coconut milk. This community dinner is then followed by a procession called Ngalu Petara, which is usually taken out at the midnight hour. The procession makes seven rounds to symbolize a welcoming gesture that invites invite friendly spirits to the festival. This followed by a celebratory toast with the traditional potion, tuak, a locally brewed rice wine. This is then followed by much merriment in form of dancing, singing and drinking. On the second day of the festival all exclusivity is abandoned as tourists are invited to take part in the festivities of Gawai Dayak. The Iban and Dayak homes are then opened to the general public and guests are welcomed with a shot of rice as they are allowed a glimpse of traditional tribal life. They are also invited to try their hand at traditional activities like shooting blowpipe guns, cheering at cockfights, trying on traditional costumes and sampling delicious cakes and other sweets. One of the best locales to witness the many revelries of the Gawai Dayak festival is at the Sarawak Cultural Village in Kuching. So if you would like a finger on the pulse of Sarawak, do try and plan your visit during the Gawai Dayak annual celebrations.